#281 "Artillery Through the Ages, The Brave at Mokra, Imperial Long Shots"
Our introduction spread helps lay out our approach to such a broad theme. Paul Leach looks at the leap from “large bows” to the torsion-powered artillery of Antiquity, and presents a Roman vs. Dacian scenario. As walled towns and castles rose in importance, bigger and better ways of destroying the walls were sought. Jim Graham lifts the curtain on medieval artillery might. Dr Stephen Summerfield explains how Horse Artillery went through plenty of growing pains during the Napoleonic Wars. The development of the artillery during the American Civil War would do the work of almost 100 years in a ferociously short four year span. Neil Smith concludes our look at the development of artillery with the hop from the ACW to the European battlefields of 1914, by way of the deadly conflict between France and Prussia in 1870. Smialy translates into English as The Brave, the name given to one of the Polish Army armored trains that fought the Germans in the early days of WWII. In this article Maciek Kapalczynski explores the history of the Polish armored trains and their effectiveness in battle. This “Sudan follow-up” article discusses the Camel Corps and their use in the campaign. Flames Of War authors Phil Yates and Mike Haycock get some of the latest Battlefront early WWII figures out on the table to refight the Battle of Mokra. 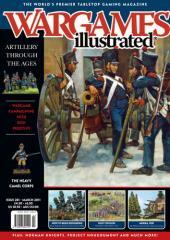 Gaming guru Rick Priestley returns to the pages of WI with an article discussing ideas for running wargames campaigns. Assembling and painting the new Flames Of War Armored Train. Barry Hilton introduces some interesting effects for the Russian Orthodox zealots present at Shevardino, 1812. Master model-maker Dave Andrews shows us just how easy it is to build fantastic looking explosion markers! PLUS we take a look at Project Hougoumont, the Nikfest show (UK), and the Great Warriors: Norman Knights.